Steve Mbogo does not regret being there for Kenyan people and would do it again! 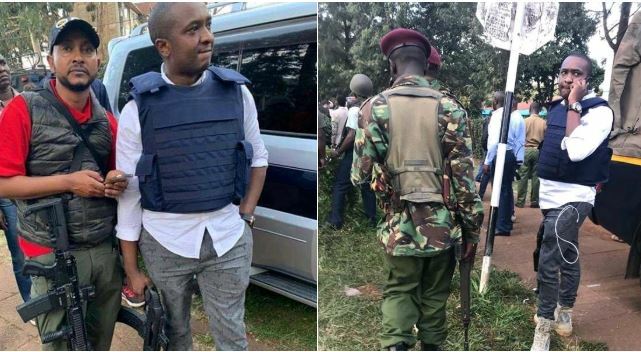 The former Starehe parliamentary aspirant, in a lengthy statement released yesterday, gave a broader explanation on why he went to the terror front at 14 Riverside Drive on Tuesday. The controversial businessman noted that he was a victim of the Westgate terror attack in 2013, something that drives him to rush to the aid of people in need without second thoughts. “To those not in know that six years ago that’s 2013 I was a victim of The Westgate attack. The horrendous memories of children and women being shot at blankly at close range on the rooftop is always etched in my mind something that drives me not to have a second thought when it comes to the aid of those under the terror trap,” said Mbogo. Steve Mbogo further said that in his capacity as a patriotic Kenya, he could not wait to be summoned to the terror attack site. He added: “I went there with hopes to help that little innocent child, the woman so afraid of what lays ahead, an incapacitated elderly on a wheelchair stretching an arm out with fright written all over his face for help. Mr Mbogo also strongly rebuked his critics describing them as “sadists on full-blown manic depression”. “Those who spewed negative barbs at my rescue session at Riverside 14 can only be likened to sadists on full blown manic depression waiting to celebrate when one of us dies,” fired Mbogo. He further clarified that he was not carrying an assault rifle but a normal short gun Model- DERYA-ANAKON 12 GAUGE shotgun with a PUMP action MAGAZINE-FED which is within use for a licensed firearm holder like himself.